10 steps to successful business case planning that ensures business success. It's a bird! It's a plane! It's…an HR professional? Yes! HR has a tremendous opportunity to be heroes in the workplace, but might need a little help developing the skills, or the superpowers, to be the heroes they were born to be. One of the most important superpowers is developing the necessary skills to build a business case to secure funds for HR initiatives. organization's most valuable asset - its employees. demonstrates the positive results the initiative will create for the organization. 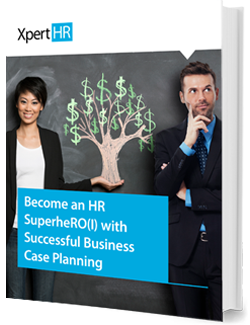 In this whitepaper, start becoming an HR SuperheRO(I) by following these 10 steps to make a business case for an HR initiative.